In a business environment increasingly dependent on software applications and devices with embedded software, the need to quickly and accurately deliver new capabilities in a cost effective, low-touch manner is critical to delivering the exceptional customer, partner and employee experience which makes a company succeed. BestIT’s application solutions ensure that your software applications efficiently and effectively support your business. We leverage best practices, tools, methodologies and industry benchmarks to develop, support or convert your applications. Our quality support for your new and existing software systems, ensuring they are updated and optimized to support your business needs. We provide your business with the implementation, configuration and ongoing support required to maximize your software investments. BestIT is more nimble and collaborative than larger providers, and more cost effective than niche providers. We develop solutions as unique as the needs of our clients, helping them take control of the full business value of their technology investments. We designed a full suite of services which can be provided stand-alone or in a standard or customized bundle: your pick your options; we integrate the services and deliver high performance. Don’t be held hostage by your Legacy Applications. Extend the life of your applications or replace them at the right time. Eradicate the root cause of your key software failures and constraints. Optimize the cost / benefit of your application portfolio. We can also fine-tune your software to get the best value for your money. How to scale your aging software. Best practices to uplift, convert or rewrite your application. Ensure every line of code is in sync with budget and critical requirements. Create competitive advantage for your business with new software and data. You do not need to be held captive by vendors and resources. Let us guide you into the functional relationships. This includes determining if you should “pay for play” or “fixed” priced engagements. The complexity of today’s applications requires meaningful software development practices that ensure the scalability and maintainability of the software. 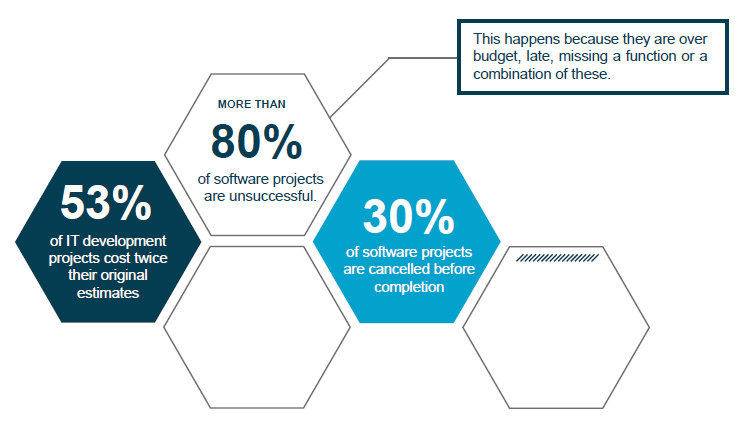 Investing in software development best practices improves overall application quality, increases developer productivity, expands the usable life of an application and lowers maintenance costs. In a rapidly changing business and technical environment, the capacity to create or modify your existing application is a critical differentiator in responding to your users expectations and needs in a timely manner. Your application architecture is, however, a fragile construct that can be jeopardized with software development efforts that do not follow best practices. There is a reason why they are called “best practices:” they simply work better. As it is nowadays common to outsource part or all of the development efforts, a company needs to provide guidance and minimum expectations of quality and management of the projects. Setting up clear requirements on the quality of the code, documentation, receipt and acceptance, warranty, testing and validation are what make a project successful and predictable. BestIT encourages you to establish those minimal best practices, and can help you create and enforce them as needed. Overall, the consistent use of software development best practices at the enterprise level enables you to move resources and skills with fewer constraints, to track the progress and performance of ongoing efforts, and to better predict the date, cost and quality of the artifacts upon completion of your projects, whether internal, external or a blend of both. As your technology partner, we provide best-in-class application development services. Our team of experts in Application Development, Support and Maintenance (ADSM) carries years of experience and masters a wide variety of languages and techniques, including: Oracle Forms/Reports, Oracle EBS, Oracle CRM, JD Edwards, Salesforce.com, Java, C#.Net, ASP.Net, SSIS, SSRS and SharePoint. The software development and support team is supported by a Project Management Office that monitors performance and keeps projects on track. A team of business analysts are experts in identifying the true business problem to be solved and documenting the requirements in a language which bridges business and technology specialists. BestIT’s Quality Assurance testing team ensures that anything developed is working in accordance with the requirements and the successful delivery of artifacts is predictable and repeatable. We continue to successfully deliver value to our clients through our extensive experience. Read our case studies below as examples of our proven track record. A global leader in financial services was experiencing problems running batch applications. Financial reporting was delayed at the company and users were not satisfied with the service. BestIT identified the problem, implemented the solutions and doubled the application outputs. The BestIT Project and Program Center of Excellence revamped the entire ERP system. This pharmaceuticals company was experiencing bottlenecks and capacity limitations within its ERP systems. BestIT was called in to completely redesign the system to enable operational efficiency and speed-to-market. As technology and markets continue to evolve, businesses must seize opportunities to solve predicted challenges in this new digital environment and unpredictable challenges that can be uniquely molded to gain a competitive advantage. We look forward to assisting you with your Software Service needs. Please contact us to setup an initial free consultation. © 2018 BestIT. All Rights Reserved.